Luxury Villa with view to the Libyan sea, the Bay of Messara in the south of Crete, the Psiloritis mountain and the Messara. Top location on the hill above Pitsidia - detached, fascinating panorama - lots of light - bright and high ceilings,- natural stone and the modern, alternate with glass, harmoniously to 350 m² livingarea! Villa Thea, reached by a large curving staircase, takes as first your breathing about fascinating what is now waiting for you. You look at the beautiful pool and outdoor living area with a wind-protected and shady place, 3.50 m long table with special seating. Cook your mabye greek food in the professional outdoor kitchen too. Sunset Cooking or BBQ. An exclusive lounge seats and seat cushions invites you to a soothing relaxation. More 150 m² outdoor area offer open seating for your deck chairs. You get into the open bright kitchen, with all the comforts and even here at the big table, plenty of room for delicious meals from the sea, overlooking the sea and provide space for 8 people. You can find different games, wireless Internet, satellite TV with DVD player and a JBL On Stage system for your I-Pod. The four unique items bedrooms, each with its own separate entrance, free and unobstructed view of the fascinating, glisten sea within reach. Three en-suite shower-baths, two of them fitted with a bidet, one bath provides you a bathtub, washing machinea, dryer, iron and iron board. Towels for the Pool are available. All bedrooms are with satellite TV equipped. The individual bedrooms are with extra whisper-quiet air condition for a comfortable sleep. In addition, you will find for your added convenience, two outside shower and a guest toilet . The next highlight of the Villa Thea is the infinity pool without chlorine, equipped with a salt filtration system. From the children's pool 3.00 m x 4.00 m with Jacuzzi function, can you slide into the 5.00 m x 9.00 m x 1.50 m large infinity swimming pool. A water flush-gush shower give to you a gently massage. Green garden with palms and fruit trees and olive groves, 2 parking spaces and a barbecue are available for you. Come and enjoy your holidays. Luxury home with view to the Libyan sea, the Psiloritis mountains and the Messara- top location on the hill above Pitsidia - detached, fascinating 360 degree view - lots of light - bright and high ceilings,- natural stone and the modern, alternate with glass, harmoniously to 250 m² living area. - 24% VAT, electricity, water, sewage,, garbage disposal, final cleaning fee , cleaning of the house every 4 day's, air conditioning, if necessary also heating. - Baby Toddler Cots, high chair, hair dryer, linens,,hand, face, bath, Pool towels are in all bathrooms available. - Washing machines and dishwashers use, powder or tabs are in the houses. - You will find for easy start in your holiday some spices, toilet paper, a bottle of water for the first day. Please do not use coloured suntan cream !!!! Unless otherwise arranged, houses are available from 4.00pm on the day of arrival and need to be vacated at 10.00am at the latest on the day of departure. 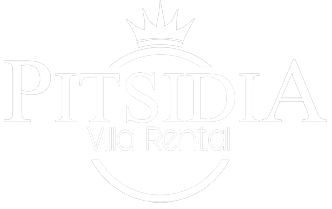 © 2016 Pitsidia Villa Rental. All rights reserved.